Part I discussed ratings for safe and toss-up seats in the Maryland Senate. Today, 7S focuses on the six Lean and Likely Democratic districts. All are currently held by incumbent Democrats. District 3 (Frederick County). Sen. Ron Young had a real scare in 2014, winning just 50.8% of the vote after defeating incumbent Alex Mooney with 51.1% in 2010. Mooney has since fled to West Virginia where he is now a U.S. Representative. This part of Frederick has been trending Democratic. Clinton carried D3 by 8. Hogan won by 15, a good margin but less impressive than in several districts held by Democrats in Anne Arundel and Baltimore. As this district has the best Democratic territory in Frederick, Young ought to be able to win a third term. But Frederick has been hotly contested between the two parties of late and this former Frederick Mayor has sometimes been a controversial figure. My current expectations remain for the GOP to have another go at Young but fall short, though they will force Democrats to scramble to retain the seat. See the map at the bottom of the post for the locations of the five Likely Democratic districts. District 8 (Baltimore County). Sen. Kathy Klausmeier won an impressive victory in 2014. Though her district went for Hogan by 36 points, she not only won but took 61.2% of the vote. In 2016, Hogan’s impressive margin evaporated as Trump carried D8 by seven-tenths of one percent. This is an interesting district because, though the incumbent has demonstrated popularity, it remains marginal turf. 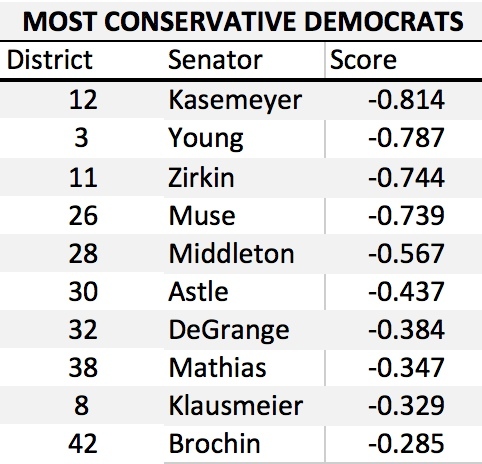 If Republicans want to make gains, they will have to look here, even if Klausmeier is clearly no easy mark. The district could become competitive with the right Republican candidate and favorable political winds. District 11 (Baltimore County). Sen. Bobby Zirkin was unopposed for reelection last time around, so what is he doing on this list? Zirkin represents a cross-pressured district that supported Hogan by 14 points even as it then went for Clinton by 24 points. Zirkin is an active legislator who champions several popular, easy-to-explain causes, such as stronger anti-domestic violence legislation. Nonetheless, if Maryland’s political climate turns against Democrats, this seat could be a surprise domino to fall. The district bears watching even if Zirkin should be in good shape. District 12 (Howard and Baltimore Counties). Another cross-pressured district, D12 went for Hogan by 11 but Clinton by 17. Budget and Taxation Committee Chair Ed Kasemeyer won reelection with a convincing, albeit a tad lower than Klausmeier, margin of 58.6%. Kasemeyer has an impressive electoral history (59% in 2014, 59% in 2010, 62% in 2006, 63% in 2002, 57% in 1998, 51% in 1994, 54% in 1986) that will make it difficult for Republicans to break through in increasingly Democratic Howard. Howard has shown itself willing to vote for particular sorts of Republicans, including County Executive Allan Kittleman, who is liberal on social questions, and Gov. Larry Hogan, who relentlessly ignores them. Can the Republicans find one to challenge Kasemeyer or win the open seat should he choose to retire? District 27 (Southern Maryland). Mike Miller entered the House of Delegates in 1971, the Senate in 1975 and became the Senate President in 1987, which makes him the longest serving legislative body leader in American history. Sen. Miller has led the Senate for so long that when I interviewed him over the telephone for my college senior thesis in the late 1980s, he was already Senate President. The Senate President represents a politically diverse district that includes big chunks of Calvert and southeastern Prince George’s Counties as well as smaller bits of Charles and St. Mary’s. The Calvert portion of the district is much more Republican than the portions in Charles or Prince George’s. Republicans would love to defeat this pillar of the Democratic Party. While he attracts complaints of being too conservative from the left, he fights very hard for members of his caucus, raising a lot of money and directing broader organizational efforts to retain a robust Democratic Senate majority. This district is also far from totally hostile territory. While Clinton won it by 5 points in 2016, Hogan also carried it by 6 points in 2014. This divergence is a lot smaller than many Maryland legislative districts and is suggestive of tighter partisan loyalties, especially among its sizable African-American minority. Republicans have not come close to defeating Miller. He won 63% in 2014, 75% in 2010, 70% in 2006, 72% in 2002, 69% in 1998, 68% in 1994, 84% in 1990, and 82% in 1986. (The State Board of Elections has not put the stone tablets with earlier election results online yet.) Despite receiving his lowest percentage since at least the 1980s in 2014, my guess is that Sen. Miller is not going to be beat. Still, the turf is marginal and remains Likely Democratic. District 32 (Anne Arundel). Yet another cross-pressured district that bears a more than passing resemblance to its nearby counterparts in Baltimore and Howard Counties, this district went for Hogan by 17 but for Clinton by 12. Moderate Sen. Ed DeGrange would seemingly be a good fit for this district. Except in these highly partisan times, some will argue that an outspoken liberal would do more to stir the troops. Like others listed here, he possesses real electoral experience, winning his seat by 59% in 2014, 60% in 2010, 61% in 2006, 59% in 2002, and 52% in 1998. The remarkable consistency since his first reelection does not look like the record of someone about to lose his seat. Nevertheless, if Republicans are to make gains, they will look to Anne Arundel and to this district along with District 30. Today, Senate President Mike Miller announced his new leadership team. Except for Sen. Ed DeGrange from Anne Arundel, all are from either Baltimore, Montgomery or Prince George’s–for the excellent reason that these jurisdictions provide the majority of the Democratic Caucus. Much speculation surrounded who would take incoming AG Brian Frosh’s place as Chair of Judicial Proceedings, and the post has gone to Sen. Bobby Zirkin, who played leadership roles in efforts to decriminalize marijuana and tighten the responsibility of dog owners for attacks by unleashed dogs. Sen. Lisa Gladden will remain Vice Chair of this committee. Sen. Jamie Raskin now heads the Executive Nominations Committee with Sen. Delores Kelley serving as Vice Chair. Less exciting during unified government, this committee will likely play a much stronger role–particularly in the next few months–with the Senate controlled by Democrats and the governorship by the Republicans. Sen. Rich Madaleno also advances to Vice Chair of the Budget and Taxation Committee. Interestingly, he now holds the same posts as U.S. Rep. Chris Van Hollen did when he was in the MD Senate. Sen. Ed Kasemeyer, a comparatively moderate Democrat, will remain chair, which likely makes Madaleno a key progressive point person on budget issues. Besides serving as Chair of the Montgomery County Senate delegation, Sen. Nancy King will now serve as Chair of the Education, Business and Administration Subcommittee of the Budget and Taxation Committee. Another progressive, Sen. Paul Pinsky, advances to Vice Chair of Education, Health and Environmental Affairs. Sen. Joan Carter Conway remains the Chair of this Committee. This committee also remains a likely flashpoint between the Governor-Elect and the Democratic General Assembly. Senator Bobby Zirkin (Baltimore County, D-11) will become the Chair of the Judicial Proceedings Committee. Senator Zirkin has served on the Judicial Proceedings Committee during his time in the Senate, and served as a member of the House Judiciary Committee during his time in the House. “Senator Zirkin has been a key leader on judicial issues, and I know he is the right person to lead this committee,” stated Senator Miller. “His work in the legislature, and in his law practice provides him with the real-world experience that will allow him to lead the Judicial Proceedings Committee through the many difficult issues they will face.” Senator Lisa Gladden will remain Vice-Chair of the Judicial Proceedings Committee. Senator Paul G. Pinsky (Prince George’s County, D-22) will serve as Vice-Chair of the Education, Health, and Environmental Affairs Committee. Senator Pinsky has served on the Education, Health, & Environmental Affairs Committee in the Senate since 1994, and as the Chair of the Education Subcommittee since 2003. “Senator Pinsky has the depth of knowledge of the issues needed to help guide this committee,” stated Senator Miller. “His keen understanding of educational and environmental issues will be an asset to our state moving forward.” Senator Joan Carter Conway will continue to serve as Chair of the Education, Health, and Environmental Affairs committee. Senator James “Ed” DeGrange (Anne Arundel County, D-32) will serve as Vice-Chair of the Rules Committee. Senator DeGrange has served in the Senate since 1998, and has formerly served as Vice-Chair of the Executive Nominations Committee, and currently serves as Chair of the Public Safety, Transportation, and Environment Subcommittee of the Budget and Taxation Committee, as well as Chair of the Capital Budget Subcommittee of the Budget and Taxation Committee. Senator DeGrange will continue in both these roles. Said Senator Miller: “Senator DeGrange is a true leader in the Senate and his longevity and leadership will ensure that the Rules Committee will have a strong voice as Vice-Chair.” Senator Katherine Klausmeier will continue to serve as Chair of the Committee on Rules. Senator Katherine Klausmeier (Baltimore County, D-8) will serve as the Deputy Majority Leader. Senator Klausmeier has served in the Senate since 2003, and the General Assembly since 1995. “Senator Klausmeier brings a unique perspective to our Caucus, and one that helps bind together and ensure that all areas and perspectives of our state continue to be heard,” stated Senate Miller. “I am excited to have her serve our Caucus in this key leadership role.” Senator Klausmeier will also continue to serve as Chair of the Senate Rules Committee. Who is the Next Senate Majority Leader? Trying to figure out who is the next person to obtain a particular leadership position in any legislature is often a pointless exercise in Kremlinology. However, pointless exercises in Kremlinology are great fun. So here we go. After the 2010 elections, Senate Majority Leader Ed Kasemeyer was appointed Chairman of the powerful Budget and Taxation Committee. Senate President Mike Miller appointed Montgomery County Senator Rob Garagiola as his replacement. After the 2013 session, Senator Garagiola retired from the legislature. In his place, retiring Howard County Senator Jim Robey served as a placeholder Majority Leader for the 2014 Session. Following the 2014 Elections, the position will be vacant and Mike Miller will need to appoint a new Majority Leader for the fourth time in four-ish years. I asked a panel of reporters at a forum on the 2014 session who they thought had the best shot at becoming Majority Leader. None had any idea who might be on the short list. From 2011-2013, Montgomery County held to two leadership positions in the Senate (JPR Chair and Majority Leader). Montgomery County currently holds one (JPR Chair), but that is precarious as Frosh is running for Attorney General. For Maryland’s largest jurisdiction to hold no leadership positions in the upper chamber would be untenable, especially since all of Montgomery’s eight Senate seats are held by Democrats. Most people I have talked to view Jamie Raskin as the heavy favorite for the JPR Chairmanship. However, if Raskin is not appointed–and considering how far to the left of Mike Miller he is, this does not seem unrealistic to me–it would seem to necessitate the appointment of Manno, Madaleno or King as Majority Leader. I personally think Manno (who would be entering his second term in the senate) probably lacks the requisite seniority to be Majority Leader. However, stranger things have happened. Currently, Prince George’s County lacks a Committee Chairman, although Senate President Mike Miller represents a large chunk of the jurisdiction. This makes Pinsky somewhat more attractive. Who am I missing? Who do you think has the edge? What’s your analysis? Email johnga.ems@gmail.com to let me know. The General Assembly is meeting today as the session rushes to its Monday night close. Many days the General Assembly does not attract much attention, even if its decisions have a large day-to-day impact on Marylanders. This is not one of those days. The heat and light will revolve around the fierce debate in the House over marijuana decriminalization. Washington Post Reporter John Wagner and Frederick Kunkle have a fine article summarizing the state of play. The Senate passed a bill sponsored by Sen. Bobby Zirkin to decriminalize marijuana on March 14 by a vote of 36-8 with 7 Republicans joining 29 Democrats in voting green. The 8 red votes were split evenly between the two parties. Led by Chairman Joe Vallario, the Judiciary Committee proceeded to gut the bill by replacing it with text that created a task force to study the question. They then voted 14-5 to report on the bill favorably to the full House. The decision to report favorably on any bill at all was an interesting one. Last year, the Committee let a similar bill die last year without a vote. This year, they did the same to another decriminalization bill and also killed off a legalization bill. The favorable report on the bill appears to have provided a vehicle for decriminalization proponents to attempt to roll the Judiciary Committee in the full house. (Perhaps a sign of a crack in Chairman Vallario’s control?) Del. Kieffer Mitchell has offered an amendment to strike all of the House changes. Closed-door discussions late in the day Friday focused on ways to tighten several provisions in the Senate bill, according to several delegates. For example, the Senate bill would require young people caught with marijuana to appear before a judge, who could order treatment and counseling. Delegates were considering making the age that triggers that provision under 21, rather than under 18. Interestingly, at least some committee members, such as AG Candidate Aisha Braveboy, appear inclined to break with tradition by voting against their committee’s decision. Several other delegates face a similar choice, such as Del. Jeff Waldstreicher who has good relations with his chair. No doubt his constituents–and his primary opponents–will look with interest which way he jumps. You can listen to the House proceedings online if you’re so inclined. Thinking for the long term beyond this particular bill is the issue of Joe Vallario’s future as chair of the Judiciary Committee. Speaker Busch keeps a delegate who not only votes against his caucus but works repeatedly to thwart its goals at his peril. Similar situations in Congress in which conservative Democrats used their seniority to control committees inspired a revolt that led to rules reform in the 1970s. All Democratic committee chairs must now be approved by the full Caucus. Vallario has chaired this committee for over two decades. But this long tenure generates frustration as well as respect from younger delegates restless to advance. Seems like an opportunity for the Speaker to satisfy some pent up ambition. Might solve two problems at once. The bill to decriminalize marijuana use passed the Maryland Senate today by a vote of 36-8. The bill was sponsored by Sens. Zirkin and Kittleman. Voting YEA: Miller (D), Astle (D), Brinkley (R), Brochin (D), Conway (D), Currie (D), DeGrange (D), Feldman (D), Frosh (D), Glassman (R), Jacobs (R), Jennings (R), Jones-Rodwell (D), Kasemeyer (D), Kelley (D), King (D), Kittleman (R), Klausmeier (D), Madaleno (D), Manno (D), McFadden (D), Middleton (D), Montgomery (D), Muse (D), Peters (D), Pinsky (D), Pugh (D), Ramirez (D), Raskin (D), Reilly (R), Rosapepe (D), Shank (R), Stone (D), Young (D), and Zirkin (D). Not Voting: Benson (D), Edwards (R), and Forehand (D). The bill now goes to the House of Delegates for consideration. The major challenge in the House is getting the bill past Judiciary Chairman Joe Vallario (D), who is not keen. On March 7, the Senate Judicial Proceedings Committee voted 8-3 to report favorably on SB 364, a bill to make possession of marijuana a civil rather than criminal offense, sponsored by Sen. Bobby Zirkin (D 11, Baltimore). Sens. Frosh (D), Brochin (D), Forehand (D), Jacobs (R), Muse (D), Raskin (D), Shank (R), and Zirkin (D) voted in favor. The three opposed were Gladden (D), Hershey (R), and Stone (D). Not a very partisan vote. Today, the Senate accepted two amendments offered by Chris Shank (R 2, Washington). The first amendment allows courts to sentence offenders to drug treatment programs. The second requires any monies collected to go toward drug treatment and education. Both were accepted by the sponsor and the bill passed second reading in the Senate without a recorded vote. The marijuana decriminalization bill now moves towards third and final reading in the Senate. At this point, no more amendments may be offered, so third reading will likely consist of an up or down vote on the merits of the bill as it stands. Obviously, the House of Delegates would need to pass the same bill for it to become law. Not all political feuds last forever. In a previous post, I mentioned how Del. Lou Simmons (D 17) had stated in the media that Sen. Brian Frosh had “reneged” on a deal and was “incompetent.” Frosh was also apparently feckless and disappointing. Such a louse. But apparently, all is forgiven. In a recent Gazette article, Simmons now called Frosh “the indispensable man.” You can feel the kvelling all the way from Annapolis to Montgomery County. Because that’s what happened. Otherwise, why would Simmons have his Damascene conversion on Frosh? The version adopted by the Senate will enshrine the one-bite rule into law. This rule means that if a dog has not bitten before that the owner gets a pass on liability no matter the damage even if unprovoked. I look forward to the State creating a dog bite database. Kudos to Sen. Bobby Zirkin for fighting the good fight for a stricter interpretation that makes sense. At least his efforts now mean that owners with unleashed dogs that bite will now be held responsible. 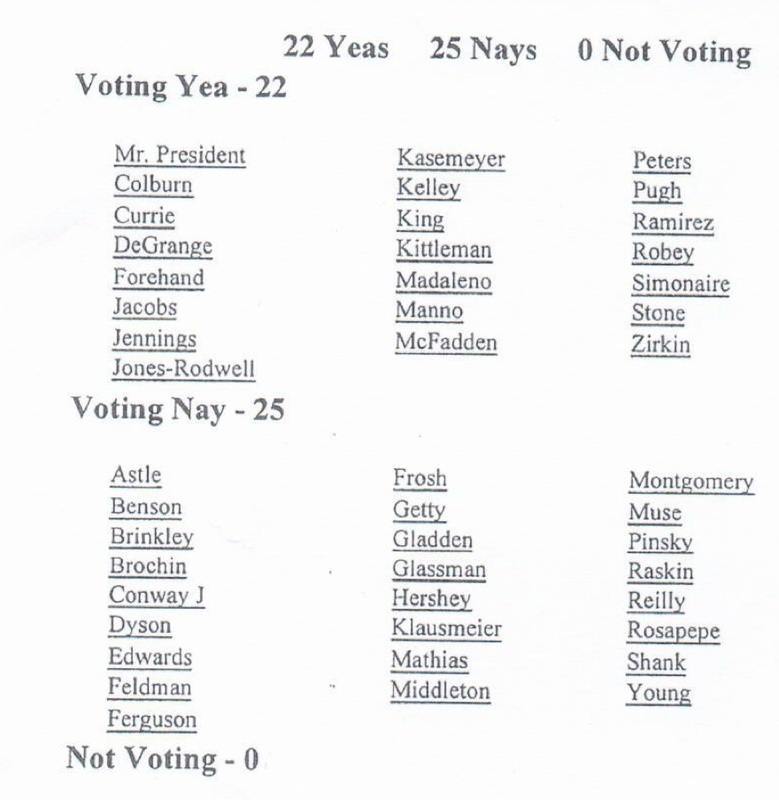 Above is the vote on the original Zirkin amendment to keep the stricter and more sensible interpretation. Kudos also to Zirkin for at least making it so that unleashed dogs will be held responsible even without the first bite. For the record, I don’t think dog owners who are walking a leashed dog should be held responsible if someone pets them without permission. But I don’t see why Simmons wants to allow one who lunges and maims someone to get a pass just because there is no evidence of a previous bite, whether or not one occurred.